The Maine State Society for the Protection of Animals is excited to announce the ground breaking ceremony for the Lawrence J. Keddy and Marilyn L. Goodreau Equine Rehabilitation Facility; a more than 14,000 square foot building to include an indoor Training/Rehabilitation Arena with an attached Welcome Center, Humane Education classroom, and administrative offices. The new $1.5 million facility will allow the Society to expand many of its program areas, including the humane education, adoption, and rehabilitation and sanctuary programs. In 2017, the MSSPA took in 21 and adopted out a record-breaking 19 equines and provided humane education to over 650 school-aged children. In 2019, after the completion of the new Training Arena and Education/Welcome Center, these numbers are expected to be even higher. 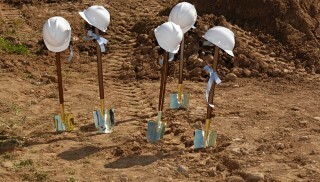 The ground-breaking ceremony is set to take place on Thursday, May 10 at 5 p.m., rain or shine. Please join the MSSPA at their 279 River Road farm in Windham for this momentous occasion. For more information, or to cover the event, please contact Meris J. Bickford at meris@msspa.org or Kathy Woodbrey at kathy@msspa.org. Both may be reached at 207-892-3040 (office).